IN 2015, 47% OF THE HOMICIDES IN BALTIMORE WERE PERPETRATED BY SOMEONE UNDER THE INFLUENCE OF ALCOHOL. More violence, including intimate partner violence7 and youth homicides8, tends to accompany more alcohol outlets. This association has been found in urban areas, like Cincinnati, OH9; Philadelphia, PA10; and Norfolk, VA11 as well as suburban areas like Bloomington, IN12 among others. 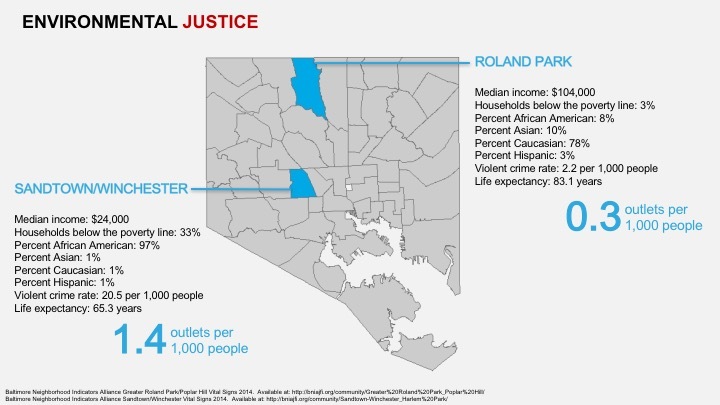 Click here to see a map3 depicting how alcohol outlets relate to violent crime in Baltimore City. alcohol outlet: a place where alcohol may be legally sold for the buyer to drink there (on-premises outlets, such as bars or restaurants) or elsewhere (off-premises outlets, such as liquor stores). Density: refers to the number of alcohol outlets in a given area. Alcohol outlet density regulation is defined as applying regulatory authority to reduce alcoholic beverage outlet density or to limit the increase of alcoholic beverage outlet density. Regulation is often implemented through licensing or zoning processes. An alcohol outlet is a place where alcohol may be legally sold for the buyer to drink there (on-premises outlets, such as bars or restaurants) or elsewhere (off-premises outlets, such as liquor stores). Density refers to the number of alcohol outlets in a given area. Read more about the Task Force’s review of alcohol outlet density zoning as a recommendation to address excessive alcohol consumption. State preemption is the legal doctrine that determines the level of local control over decisions affecting alcohol outlet density in a given state. The intent of a state-specific legal analysis is to provide educational resources to community coalitions, policy analysts, municipal governments and others assessing potential responses, both at the local and state level, to the problems created by retail availability of alcohol. State preemption is the legal doctrine that determines the level of local control over decisions affecting alcohol outlet density in a given state. Local governments have the authority to regulate alcohol outlet density only to the extent that the state grants them that authority. Click here to find out how your community can make a difference! Community Anti-Drug Coalitions of America (CADCA) and the Center on Alcohol Marketing and Youth (CAMY) at The Johns Hopkins Bloomberg School of Public Health have developed Strategizers to assist state and local public health departments and communities in planning, implementing, and evaluating prevention strategies recommended by the independent, non-federal Community Preventive Services Task Force. These recommendations are based on systematic reviews of the available scientific evidence of the effectiveness of public health strategies in preventing excessive alcohol consumption and related harms. Summaries of the Task Force’s recommendations and the research on which they are based can be accessed on the Community Guide website. 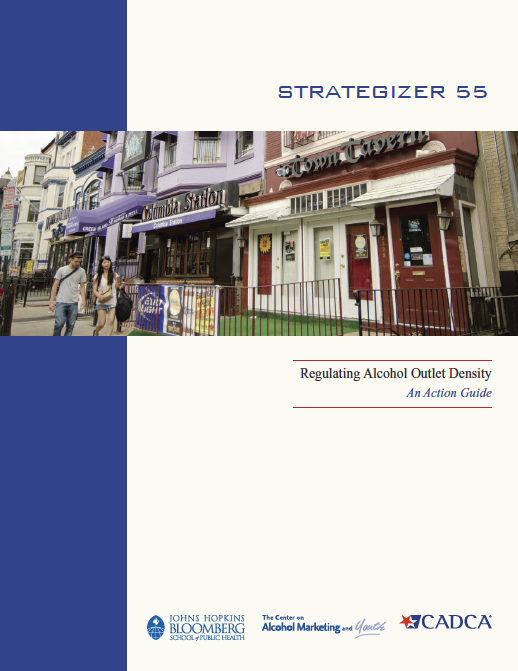 This Strategizer supports community efforts to reduce the number of places that sell and serve alcohol by providing information and guidance on implementing public health and legal strategies. 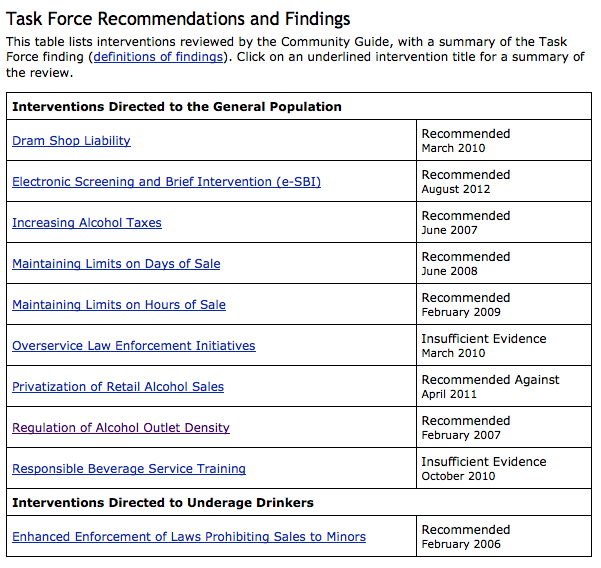 Although state and local public health departments are the primary audience for this Action Guide, it is also intended to support the work of community coalitions on the prevention of excessive alcohol consumption, and to help build collaborations between these coalitions and public health agencies in achieving this share objective. Milam, A.J., Furr Holden, C.D.M., Cooley Strickland, M.C., Bradshaw, C.P., Leaf, P.J. Risk for Exposure to Alcohol, Tobacco, and Other Drugs on the Route to and from School: The Role of Alcohol Outlet. Prev Sci. Feb 2013;(1):12-21. Chen MJ, Gruenewald PJ, Remer LG. 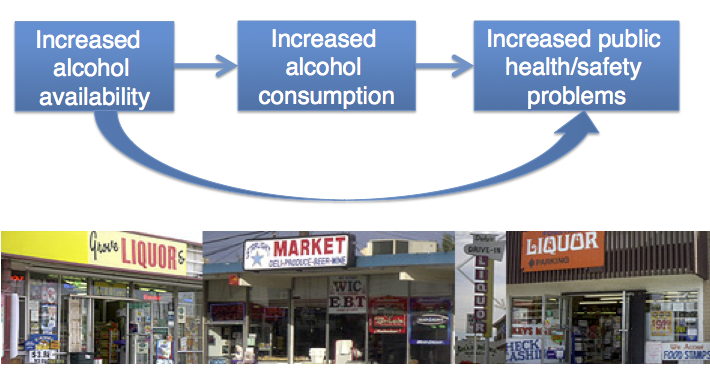 Does alcohol outlet density affect youth access to alcohol? Journal of Adolescent Health. 2009;44(6):582-589. Jennings JM, Milam AJ, Greiner A, Furr-Holden CD, Curriero FC, Thornton RJ. Neighborhood alcohol outlets and the association with violent crime in one mid-Atlantic City: the implications for zoning policy. Journal of Urban Health. 2014;91(1):62-71. Scribner RA, MacKinnon DP, Dwyer JH. Risk of assaultive violence and alcohol availability in Los Angeles County. American Journal of Public Health. 1995;85(3):335-340. Roncek D, Maier P. Bars, blocks, and crimes revisited: Linking the theory of routine activities to the empiricism of “hot spots”. 1991;29(4):725-753. Speer PW, Gorman DM, Labouvie EW, Ontkush MJ. Violent crime and alcohol availability: relationships in an urban community. Journal of Public Health Policy. 1998;19(3):303-318. Kearns, M. C., Reidy, D. E., & Valle, L. A. (2015). The Role of Alcohol Policies in Preventing Intimate Partner Violence: A Review of the Literature. The Journal of Studies on Alcohol and Drugs, 76(1):21-30. Parker R. N.,Williams K. R.,McCaffree K. J., Acensio, E. K., Browne, A., Strom, K. J., and Barrick, K. (2011). Alcohol Availability and Youth Homicide in the 91 Largest US Cities, 1984-2006. Drug and Alcohol Review, 30(5):505-14. Grubesic, T. H.,Pridemore, W. A.,Williams, D. A., & Philip-Tabb, L. (2013). Alcohol Outlet Density and Violence: The Role of Risky Retailers and Alcohol-Related Expenditures. Alcohol and Alcoholism, 48(5):613-619. White, G. F., Gainey, R. R., & Triplett, R. A. (2015). Alcohol Outlets and Neighborhood Crime: A Longitudinal Analysis. Crime & Delinquency, 61(6):851-872. Snowden, A. J. & Pridemore, W. A. (2013). 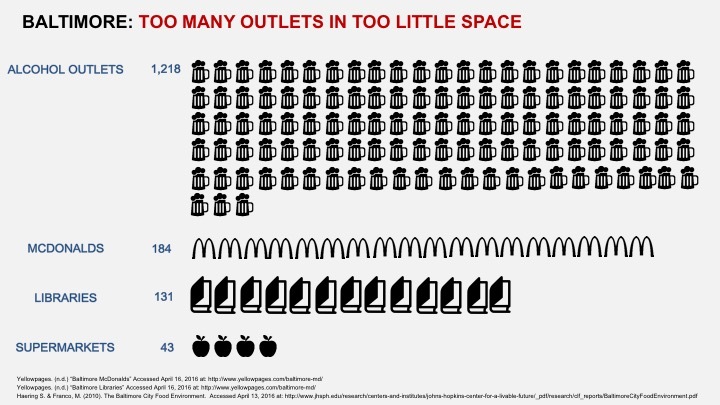 Alcohol and Violence in a Nonmetropolitan College Town: Alcohol Outlet Density, Outlet Type, and Assault. Journal of Drug Issues,43(3):357-373. Giesbrecht, N.,Huguet, N.,Ogden, L., Kaplan, M. S., McFarland, B. H., Caetano, R., Conner, K. R., & Nolte, K. B. (2015). Acute Alcohol Use among Suicide Decedents in 14 US States: Impacts of Off-premise and On-premise Alcohol Outlet Density. Addiction, 110(2):300-307. Gruenewald PJ. Regulating availability: How access to alcohol affects drinking and problems in youth and adults. Alcohol Health and Research World. 2011;34(2):248-256. Wilkinson, C. and M. Livingston, Distances to on- and off-premise alcohol outlets and experiences of alcohol-related amenity problems.Drug Alcohol Rev, 2012. 31(4): p. 394-401. © 2019 Baltimore Good Neighbors Coalition. Built using WordPress and OnePage Express Theme.